Two Pianos Four Hands (or 2P4H) opened yesterday for one last encore run in Toronto. If, like me, you somehow haven’t seen it, go. I guarantee you’ll enjoy it. How could you not? The theme is universal, masquerading as a play about piano lessons. Ted Dykstra and Richard Greenblatt created, directed and performed the show. They developed it about 15 years ago and it’s based on their individual piano lesson experiences. Both are very talented pianists. And very talented actors. I’d go see either of them read the phone book – and pay to do it. 2P4H is a deceptively simple piece of theatre. Act 1 is a series of vignettes of boys at piano lessons and practising the piano. It’s very funny. Greenblatt and Dykstra make you believe they are 10 year old boys. The body language is priceless. My companion Tasha said that her favourite part of the show was a scene where two 10 year old boys are practising a piece for a Kiwanis music festival. I’d be hard pressed to pick a favourite part of the show. Some of the facial expressions were gems of acting brilliance. The second act is darker, although still very funny. The boys are 17 and have to decide whether they are going to continue with classical music. We’ve all had to do it, decide whether or not we’re good enough and committed enough to be the best at something. I said the theme is universal. It is. It doesn’t matter whether it’s piano, swimming, tennis, dancing, hockey, or gymnastics. It doesn’t even matter whether it’s something we did as children or something we did as adults. Ultimately it’s a play that we can all relate to. And laugh while we do it. It’s easy to understand why it’s been so successful over the years. 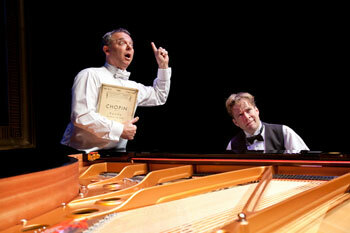 – Two Pianos Four Hands is playing at the Panasonic Theatre (651 Yonge Street) until November 20th. – Performances are Wednesday to Saturday at 8pm, Wednesday, Saturday, Sunday at 2pm.